That's a great question! You have touched upon a huge area of study of materials science, of which the answer might surprise you. Crystals may be found everywhere, and so have any application conceivable. In materials science, what constitutes a crystal is much more general than perhaps what one thinks of at first. A crystal is any material exhibiting long-range order. In which the atoms fill in the spots designated by the lattice. The lattice and basis can become complicated quickly, but we'll stick with the basic examples. You can further describe a crystal structure with a unit cell and basis vectors. A unit cell is a small chunk of atoms that when translated can reproduce the crystal structure. Two examples are shown in the colored boxes. The directions that you translate the unit cell are the basis vectors. As you can see, the definition of the unit cell is not unique. Metals exhibit a variety crystal structures, such as body-centered cubic and face centered cubic. These are basically names for how the atoms pack together. There are definitely many uses of metals and metal alloys, such as steel and bronze. What are a few you can name? read in this link . There's even a whole branch of mathematics that is used to describe crystal structures, known as group theory. Most elements exhibit a crystalline structure at equilibrium. 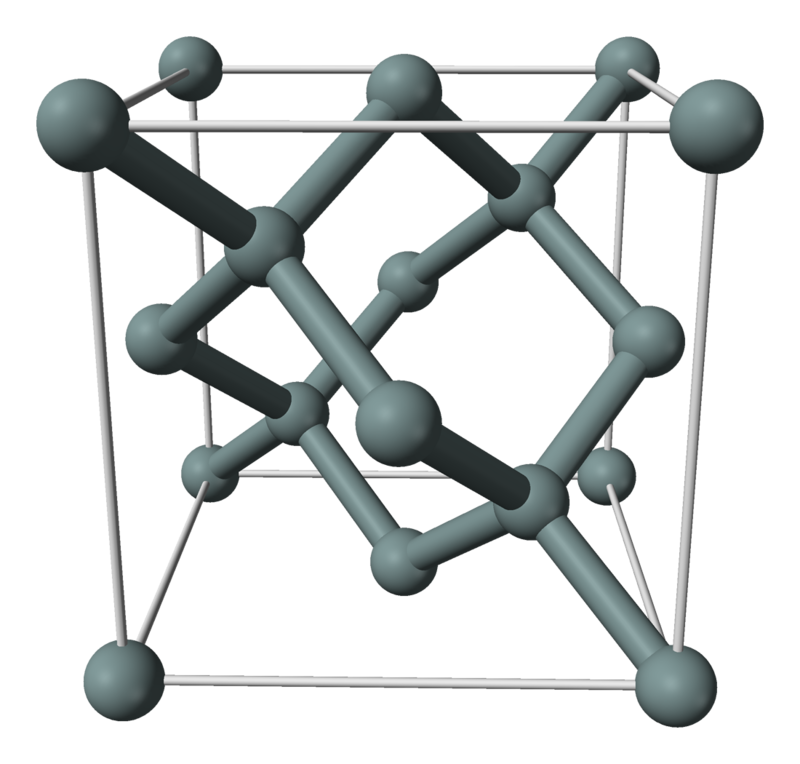 Perhaps most notable is silicon, which has the diamond face centered cubic structure: cubic structure. Crystalline silicon, as you may know, is used in pretty much every electronic device ever, such as transistors, lasers, integrated circuits, and solar cells. This also extends to research on materials that people are studying to replace silicon. This is still a very active area of research. For example, in the research for my lab group, we study electronic and optical properties of metal oxides and nitrides using first-principles calculations/simulations. Because modeling a real solid with 1026 atoms is extremely difficult to do mathematically, we use the concept of the unit cell in crystals in our research on a daily basis to simplify the math. From our research, we can explain and make predictions on a variety of material properties that are useful in applications ranging from LEDs to transistors to smart windows to even quantum computing! The possible number of crystal structures is huge and can become quite complex. One example is shown on the link for a new material, Li9V3P(8-x)O(29-x) being studied for rechargeable Li-ion batteries click here to see. Every yellow triangle and blue octahedra correspond to a group of atoms. This would be a nightmare to draw by hand, but luckily there are programs that can do it for you. Other examples of uses of crystals also extend to beyond the inorganic examples shown so far. For example, the crystalline structure of proteins is heavily studied in biology click here to see example. Proteins are extremely important for all kinds of cell functions, and understanding the structure allows researchers to understand how they function and interact with their environment. 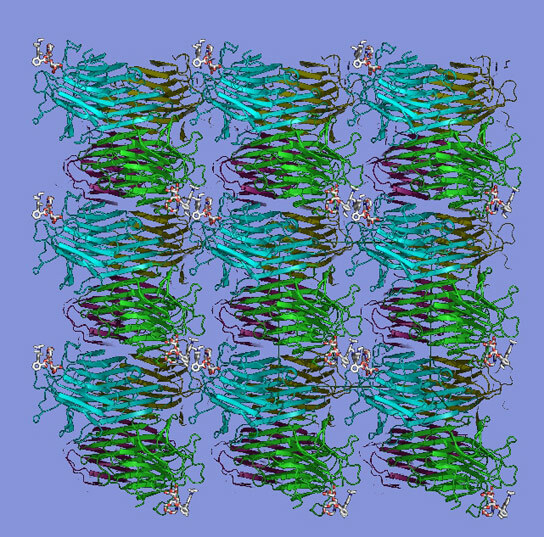 All the colored ribbons correspond to different chains of proteins. As per the definition of a crystal, can you deduce what the repeated unit cell would be? But what does it mean to not be crystalline? It means to not have long-range order. One common case is the amorphous phase, in which only short-range order is present. You are very familiar with an everyday amorphous material - window glass (silicon dioxide)!. A diagram of the structure of amorphous glass is shown here. As you can see, there isn't the long range order that is present in the crystalline phase. However, locally, each Si atom looks just like it does in the crystalline phase. The only thing that is different are the bond angles and degree of bonding that occurs (i.e., not every oxygen is bonded to two Si, as found in the crystalline phase). For this reason, amorphous solids tend to have a lower density than crystalline ones. In order to obtain the amorphous phase, one generally has heat up their material past the critical temperature and quench it (i.e., cool it very quickly). The most important part is the quenching. When materials are in their liquid state, there is no semblance of crystalline order (think of the different between water and ice), so if you freeze this lack of crystalline structure quickly, you can obtain the amorphous phase. There are also not quite crystalline phases that have been found. An important electronic device example is the liquid crystal (e.g., liquid crystal displays, LCDs). Although LCDs have advanced quite a bit, its basic functionality can be captured with the display on your calculator or watch. The question is, how can you modulate the screen pixels to be selectively black? The engineered answer is liquid crystals. A liquid crystal is a material that exhibits both liquid and crystalline behavior. They are generally composed of long and rigid hydrocarbon chains such that these chains line up in an ordered fashion over a long range (like a crystal! ), but because these chains are not strongly bonded to each other, it can flow like a liquid. To get a pixel, you sandwich some liquid crystal material between two polarizers that are at right angles, and you hook it to an external circuit. Polarizers filter light and only let light going in one direction to go through; when two polarizers are at right angles, no light passes through. What happens? Crystals are any solid substance that forms a regular spacing of atoms inside of it. This includes ALL minerals, nearly all rocks (which are made of minerals), ice, the solid material that makes up the bones and shells of living beings, the lenses of your eyes, etc. They are so ubiquitous a phenomenon in nature that you can't really begin to ask what their uses are. A potentially correct answer would be "nearly everything". Interesting question with a few answers. Different fields define crystals based on different length scales, so we must first define a crystal. In materials science, a crystal is defined as a periodic arrangement of atoms with translational symmetry. This means that the local structure of atoms is repeated. Materials scientists and solid-state physicists study the behavior of materials as it relates to their crystal structure. One cool example is piezoelectricity, where stresses in the material induce a spontaneous polarization which can be used to generate electricity. This property leads to applications in energy generation from vibrational energy, such as in pacemakers and sidewalk tiles. Another important example is the production of single crystal silicon, which enables almost all electronic devices that we use today. Outside of scientific circles, crystals are viewed as how they appear to the eye instead of their arrangement of atoms, and the word crystal is often used interchangeably with mineral. The appearance of these minerals and materials can be described based on both the arrangement of atoms and how the material formed. In summary, crystal is both a concept to describe the arrangement of atoms in a material and a word used to describe minerals and other cool materials macroscopic periodicity (e.g., bismuth). The uses of the former are important to research, and the use of the latter is important for geologists to study the earth, as well as yielding some magnificent specimens for the eye. I encourage you to look at the Smithsonian online resources about crystals and minerals. Crystals come in many kinds. This is because a crystal is a substance that has its molecules packed together a certain ordered way. For example, salt is a crystal. Here is an image that may help you see this. - Diamonds are crystals. They are used in jewelry, and industrial applications like drill tips. - Calcite is a crystal that is often a part of shells of animals like mollusks.